Remembering the heat and humidity of Nashville in the summer, we had packed for the tropics. But our first Sunday here, the last Sunday in June, was a complete surprise, a total gift. Blue skies, puffy clouds, moderate temperatures, glistening green hills all shouted of God’s glory. As San Diegans, we automatically think of heading to the ocean on such a day, but here in Nashville, Arrington Vineyards seems to have come to mind for hundreds of people wanting to be outside to enjoy the beauty of a summer day. Overlooking verdant vineyards in the rolling hills of central Tennessee, the wide grassy slope was dotted with picnickers at rustic wooden tables under tall shade trees. Music and fragrance filled the air. A path through the woods led to a barn and another lush lawn seating area where a bluegrass band livened up the atmosphere. Back up the hill on the other side of the property was a wide tented pavilion for those who preferred jazz. Both styles seemed entirely appropriate for the setting and Jeff and I enjoyed spending time in each location. Since Nashville is a magnet for the most talented musicians in the world, it is impossible to have a bad listening experience here. That morning we had visited a church where our daughter and son-in-law brought us sweet remembrances of ourselves at that stage in life, filling in as worship leaders in the summertime at a variety of churches. Listening to Caleb at the piano creatively accompanying Emily’s exquisitely beautiful singing, it was hard to hold back tears—and easy to sense the presence of the Lord. Holding my granddaughter on my lap, remembering my son back home in the pulpit preaching God’s Word that morning as well, my heart was filled with love and gratitude. There is no greater joy. To God be the glory. God’s Spirit was clearly there with us that morning in church. But isn’t God always with us, always there, always present? Could we also worship at a vineyard later that day? Jeff and I are celebrating our 36th anniversary this week. Don’t look to us if you want a model for perfect harmony and ease in marriage, but we can help you if you need to see steadfast determination to stay together, to let God work in our lives despite our differences— and to find him always faithful. It is significant that we were married at church named Grace and Peace Fellowship. It is only our daily fellowship with God that allows us to live together with any kind of grace and peace at all. Although we love each other, there are days we disagree and other days when we are just plain disagreeable. Our “tendencies” seem to grow stronger as the years pass, and we need to fight harder in what is surely a spiritual battle to bring us down. But we know God. And we know that he does what we cannot. He is the one who gives us hope. We fight, but we forgive. We struggle, but we stay— and we pray—and we live another day to give him glory. That Sunday afternoon, as we sat together, both listening attentively and appreciatively, we exchanged comments about the musicians and their song choices and their technique and their equipment. I suddenly saw with clarity and gratitude that God had actually given me a kindred spirit in a man who sometimes seems to be so opposite to me. God had given us each the gift of a friend who loved music as much as we did, whether it be hymns, or fiddle tunes, or swampy blues. To God be the glory. This quote had popped up on my Twitter feed early in the week and arrested my attention. Peterson’s words sharpened my perspective and enlivened my sense of the sacred all week. As a worship leader, my calling since I first surrendered to the Lord, leading worship can sometimes carry with it a sense of toil. Songs to pick, practices to arrange, problems with both technical equipment and personnel. Someone has to drive so others can enjoy the ride. Although you know better, you start thinking of worship time as music time. But Peterson’s words cut some chains for me. Worship looks less like striving and more like surrender. Less activity, more stillness, more just plain seeing the hand of the Lord in every line of the story. A simple turning of our eyes from our own weaknesses and concerns to the reality of his presence with us. For us. Forever. When I first began to think and write about living crosswise, I started to look up and see crosses in the clouds on a regular basis. They would reassure me of the presence of the Lord and his individual love for each of us. 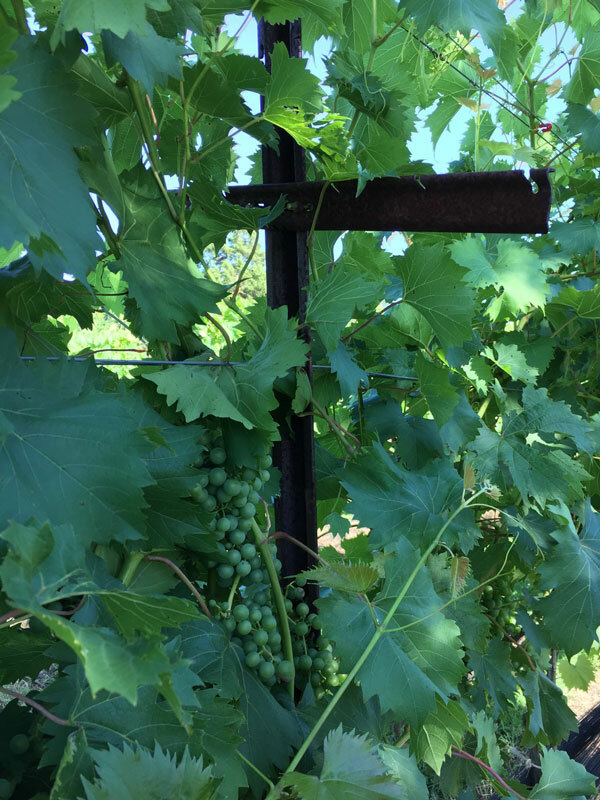 But on this perfect summer day, my cross-sighting came embedded in grapevine. 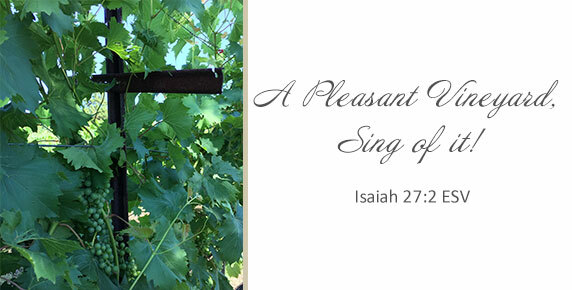 As a Bible believer, the imagery of vine and vinedresser, of crushed grapes, of bread and wine aren’t far from your mind as you stroll through a lush vineyard. As we headed back down the hill toward our car, I couldn’t help but snap the image I saw as I stopped to peer closely at the grapevine. It’s true. Worship happens when we slow down and get still enough to notice his presence. Our hearts begin to fill with affection for the loving Father whose Word points us to all he has done for us, from creating this beautiful world as our home, to rescuing us from its fallenness so that one day we can join him in our eternal home. The beauty we take time to notice now is just a hint of what is to come. There was beauty in that vineyard. And a reminder of Jesus’ sacrifice of love. And in our marriages as well, we can choose to slow down and get still enough to notice our spouse, to look for the ways God has given us a specially chosen gift. It is the noticing for the purpose of appreciating that renews our feelings so that our lifelong commitment can endure. A reminder that all love requires sacrifice. I don’t know exactly what I was thinking 36 years ago, when as a new Christian , I suggested to Jeff that we have Galatians 5:22 engraved inside our wedding bands. I think in my naïveté, I was looking at just the first part of the verse about love and joy, happy that I had finally found it, and selecting words that described my groom, like kindness and gentleness. I had no idea about what it would take for fruit to grow! I knew nothing about plowing or pruning. About the rigor that is required to grow patience and self-control. This picture, however, tells a reassuring the story of a marriage that has withstood 36 years. Jesus is the true vine and our Father is the vinedresser. Any fruit that we will ever bear comes from the presence of our Savior, Jesus Christ in the very center of our lives. And we both know it full well.